Every piece of kitchen equipment is important, so it’s vital that each piece is easily accessible to keep your kitchen running smoothly. 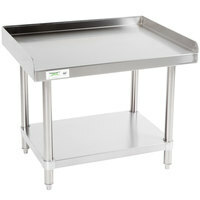 Using equipment stands in your restaurant or other commercial kitchen raises up ovens, slicers, mixers, and other large items, so the controls can be reached without having to bend down. This reduces the time it takes to use the equipment and lowers the risk of your staff getting injured while on the job. 1 30 3/4" X 35"
1 36 3/4" X 6"
1 36 3/4" X 12"
1 36 3/4" X 18"
1 36 3/4" X 24"
1 36 3/4" X 36"
Good - The 16 gauge Regency 30" x 48" equipment stand is an economical choice that will stand up to the rigors of daily usage. It features galvanized steel legs that elevate the stand to the proper height, and a galvanized undershelf for additional storage space. It also features plastic bullet feet, providing stability when operating equipment and adjustability to prevent wobbling. 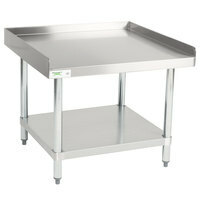 Best - The 16 gauge Regency 30" x 48" stainless steel equipment stand is the perfect choice for your busy kitchen. 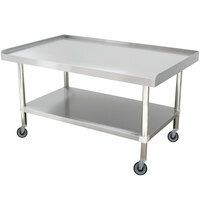 Durable and easy to clean, it boasts stainless steel legs and undershelf, which offer greater corrosion resistance than galvanized construction. The adjustable bullet feet are also made of stainless steel, providing a stronger alternative to typical plastic feet. Good - The 16 gauge Regency 30" x 36" equipment stand is an economical choice that will stand up to the rigors of daily usage. It features galvanized steel legs that elevate the stand to the proper height, and a galvanized undershelf for additional storage space. It also features plastic bullet feet, providing stability when operating equipment and adjustability to prevent wobbling. 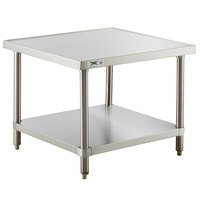 Best - The 16 gauge Regency 30" x 36" stainless steel equipment stand is the perfect choice for your busy kitchen. Durable and easy to clean, it boasts stainless steel legs and undershelf, which offer greater corrosion resistance than galvanized construction. The adjustable bullet feet are also made of stainless steel, providing a stronger alternative to typical plastic feet. 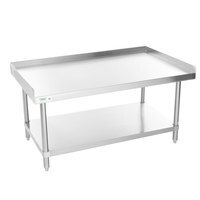 The 18 gauge Regency 24" x 24" stainless steel mixer table is an economical choice that will stand up to the rigors of daily usage. 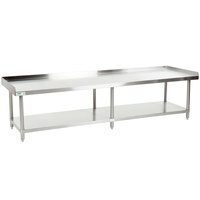 It features galvanized steel legs that elevate the table to the proper height, and a galvanized undershelf for additional storage space. It also features adjustable plastic bullet feet to provide stability and prevent wobbling when operating equipment. 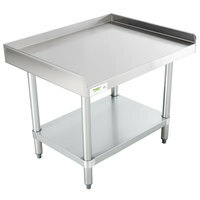 The 16 gauge Regency 24" x 24" stainless steel mixer table is the perfect choice for your busy kitchen. Durable and easy to clean, it boasts stainless steel legs and undershelf, which offer greater corrosion resistance than galvanized construction. The adjustable bullet feet are also made of stainless steel, providing a stronger alternative to typical plastic feet. 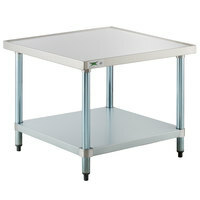 The 16 gauge Regency 24" x 30" equipment stand is an economical choice that will stand up to the rigors of daily usage. It features galvanized steel legs that elevate the stand to the proper height, and a galvanized undershelf for additional storage space. It also features plastic bullet feet, providing stability when operating equipment and adjustability to prevent wobbling. 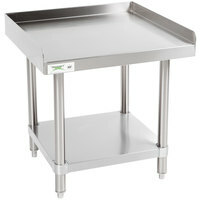 The 16 gauge Regency 24" x 30" stainless steel equipment stand is the perfect choice for your busy kitchen. 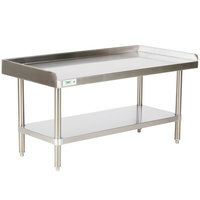 Durable and easy to clean, it boasts stainless steel legs and undershelf, which offer greater corrosion resistance than a galvanized construction. The adjustable bullet feet are also made of stainless steel, providing a stronger alternative to plastic feet. Good - The 16 gauge Regency 24" x 24" equipment stand is an economical choice that will stand up to the rigors of daily usage. It features galvanized steel legs that elevate the stand to the proper height, and a galvanized undershelf for additional storage space. It also features plastic bullet feet, providing stability when operating equipment and adjustability to prevent wobbling. 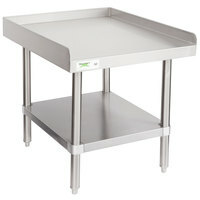 Best - The 16 gauge Regency 24" x 24" stainless steel equipment stand is the perfect choice for your busy kitchen. Durable and easy to clean, it boasts stainless steel legs and undershelf, which offer greater corrosion resistance than galvanized construction. The adjustable bullet feet are also made of stainless steel, providing a stronger alternative to typical plastic feet. Good - The 16 gauge Regency 30" x 72" equipment stand is an economical choice that will stand up to the rigors of daily usage. 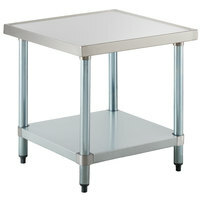 It features galvanized steel legs that elevate the stand to the proper height, and a galvanized undershelf for additional storage space. It also features plastic bullet feet, providing stability when operating equipment and adjustability to prevent wobbling. 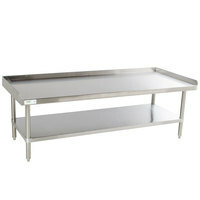 Best - The 16 gauge Regency 30" x 72" stainless steel equipment stand is the perfect choice for your busy kitchen. 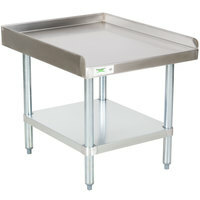 Durable and easy to clean, it boasts stainless steel legs and undershelf, which offer greater corrosion resistance than galvanized construction. The adjustable bullet feet are also made of stainless steel, providing a stronger alternative to typical plastic feet. Good - The 16 gauge Regency 30" x 24" equipment stand is an economical choice that will stand up to the rigors of daily usage. It features galvanized steel legs that elevate the stand to the proper height, and a galvanized undershelf for additional storage space. It also features plastic bullet feet, providing stability when operating equipment and adjustability to prevent wobbling. 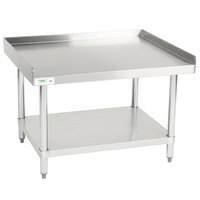 Best - The 16 gauge Regency 30" x 24" stainless steel equipment stand is the perfect choice for your busy kitchen. Durable and easy to clean, it boasts stainless steel legs and undershelf, which offer greater corrosion resistance than galvanized construction. The adjustable bullet feet are also made of stainless steel, providing a stronger alternative to typical plastic feet. Good - The 16 gauge Regency 30" x 60" equipment stand is an economical choice that will stand up to the rigors of daily usage. It features galvanized steel legs that elevate the stand to the proper height, and a galvanized undershelf for additional storage space. It also features plastic bullet feet, providing stability when operating equipment and adjustability to prevent wobbling. 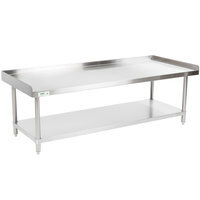 Best - The 16 gauge Regency 30" x 60" stainless steel equipment stand is the perfect choice for your busy kitchen. 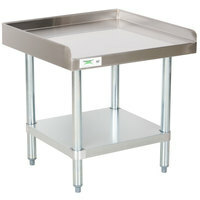 Durable and easy to clean, it boasts stainless steel legs and undershelf, which offer greater corrosion resistance than galvanized construction. The adjustable bullet feet are also made of stainless steel, providing a stronger alternative to typical plastic feet. Good - The 16 gauge Regency 30" x 30" equipment stand is an economical choice that will stand up to the rigors of daily usage. It features galvanized steel legs that elevate the stand to the proper height, and a galvanized undershelf for additional storage space. It also features plastic bullet feet, providing stability when operating equipment and adjustability to prevent wobbling. 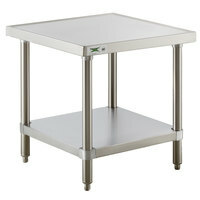 Best - The 16 gauge Regency 30" x 30" stainless steel equipment stand is the perfect choice for your busy kitchen. Durable and easy to clean, it boasts stainless steel legs and undershelf, which offer greater corrosion resistance than galvanized construction. The adjustable bullet feet are also made of stainless steel, providing a stronger alternative to typical plastic feet. Good - The 16 gauge Regency 24" x 48" equipment stand is an economical choice that will stand up to the rigors of daily usage. 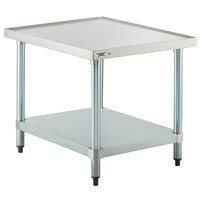 It features galvanized steel legs that elevate the stand to the proper height, and a galvanized undershelf for additional storage space. It also features plastic bullet feet, providing stability when operating equipment and adjustability to prevent wobbling. 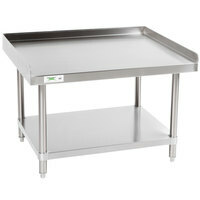 Best - The 16 gauge Regency 24" x 48" stainless steel equipment stand is the perfect choice for your busy kitchen. Durable and easy to clean, it boasts stainless steel legs and undershelf, which offer greater corrosion resistance than galvanized construction. The adjustable bullet feet are also made of stainless steel, providing a stronger alternative to typical plastic feet. Good - The 16 gauge Regency 24" x 36" equipment stand is an economical choice that will stand up to the rigors of daily usage. It features galvanized steel legs that elevate the stand to the proper height, and a galvanized undershelf for additional storage space. It also features plastic bullet feet, providing stability when operating equipment and adjustability to prevent wobbling. 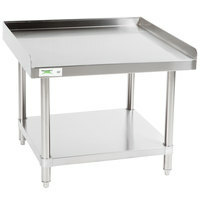 Best - The 16 gauge Regency 24" x 36" stainless steel equipment stand is the perfect choice for your busy kitchen. Durable and easy to clean, it boasts stainless steel legs and undershelf, which offer greater corrosion resistance than galvanized construction. The adjustable bullet feet are also made of stainless steel, providing a stronger alternative to typical plastic feet. 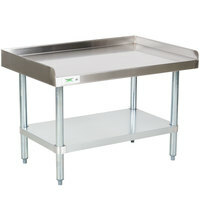 The 18 gauge Regency 30" x 30" stainless steel mixer table is an economical choice that will stand up to the rigors of daily usage. 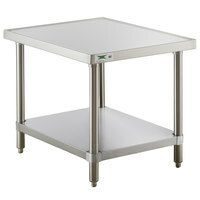 It features galvanized steel legs that elevate the table to the proper height, and a galvanized undershelf for additional storage space. It also features adjustable plastic bullet feet to provide stability and prevent wobbling when operating equipment. 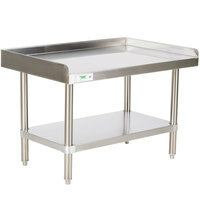 The 16 gauge Regency 30" x 30" stainless steel mixer table is the perfect choice for your busy kitchen. Durable and easy to clean, it boasts stainless steel legs and undershelf, which offer greater corrosion resistance than galvanized construction. The adjustable bullet feet are also made of stainless steel, providing a stronger alternative to typical plastic feet. 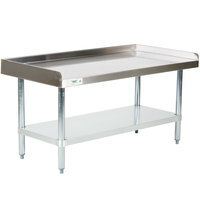 The 18 gauge Regency 30" x 24" stainless steel mixer table is an economical choice that will stand up to the rigors of daily usage. 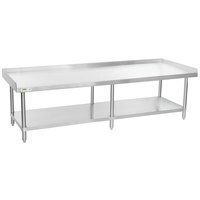 It features galvanized steel legs that elevate the table to the proper height, and a galvanized undershelf for additional storage space. It also features adjustable plastic bullet feet to provide stability and prevent wobbling when operating equipment. 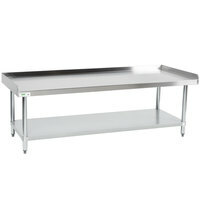 The 16 gauge Regency 30" x 24" stainless steel mixer table is the perfect choice for your busy kitchen. 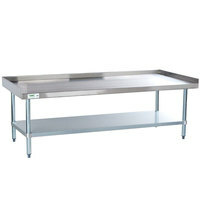 Durable and easy to clean, it boasts stainless steel legs and undershelf, which offer greater corrosion resistance than galvanized construction. The adjustable bullet feet are also made of stainless steel, providing a stronger alternative to typical plastic feet.